Yet again I have proved to myself just how stupid I am. I dropped the price of “Walking over Eggshells” from Friday 25th to midnight this Sunday 28th September, and did I remember to write a blog about that momentous event? NO!!!!! 😦 Well I guess we are only half way through the price drop period, so it could be worse. I have not blogged [don’t you just hate that word?] for a few days as I’ve been busy finishing the first draft of Book 3 – sadly no title yet [have you entered the competition?] . To fully appreciate it, I would recommend reading my first memoir before you consider the second as it will tie up some stuff. Here is a sneak preview of the first paragraph. I have decided that tomorrow, I am going to kill Caroline. I’d like to squash her flat under a road roller, or push her off the top of the Empire State Building, but I’ve never been there, and I suspect Health and Safety have got that securely enclosed. I could use a gun, a dagger, a knife or poison, but it’s all been done many times before. Thanks to Wendy for sending through the mp3 file, all you have to do is click on the link and listen! Er, no that didn’t work I tried it. Maybe cut and paste into your browser? Yes, that does it. Enjoy! I was going to write about the cheque as promised yesterday on Amie’s Facebook page, [have you had a peep at that and liked it yet?] – but I thought it would go better in a blog. Quite some time ago Amazon asked me if I would like them to send me cheques for royalties, or how about electronic payments directly into my bank? No contest, being paralytically lazy by nature I opted for the direct method and all was well, until earlier this week I received an email from the big A to tell me they were sending me a cheque. I hope they were not talking about a second cheque as this one dropped into my post box the very next day. In the meantime A sent me another e.mail imploring me to do the direct transfer thing, which I thought I had done months ago, but this time they gave me a list of all their countries and I was happy to tick all of them, tick, tick, tick I went. I was happy to accept Euros from any country in the world and would give it a warm welcome in my bank account any time. Back to the cheque – and here it is. I thought it was interesting to note that it is drawn on a German Bank, so maybe it was for a book sale in that country? I’m really not sure, but I don’t remember a German sale, France, Spain and Italy yes, but Germany? Oh well maybe it sneaked in under the radar. But then money is money right? Next point, is the German Bank would appear to be situated in Paris, and it clearly states on the front that it is payable in Paris, at 3, avenue de Friedland. Shame that, I live in Spain. Now to make this a truly multicultural cheque of many nations, it gives A’s address in Luxembourg and, wait for it, the envelope was posted in Slough, Buckingham England!! By now the poor thing must be having an identity crisis. 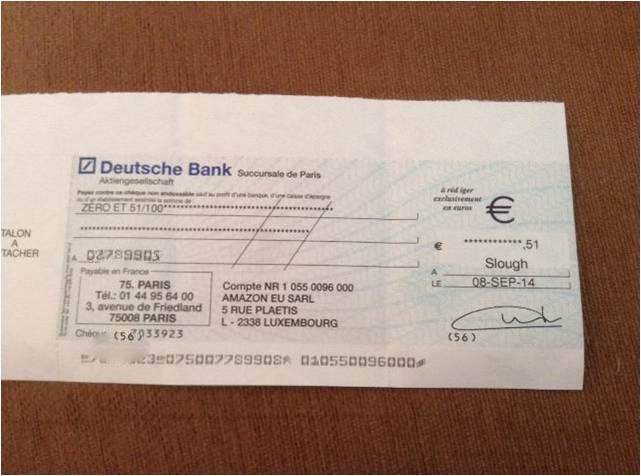 And did you notice the huge amount on the cheque, yes, zero Euros and fifty one cents. It must have been for one kindle sale and they have already withheld the thirty per cent tax. Never mind I thought, I’ll pop it into my bank account myself. I felt just a tad embarrassed as I slid it across the counter, explaining in my appalling Spanish that I knew it was for very, very little, but … er….. There followed much tapping on the computer, several frowns on the young cashier’s face, a quick shake of the head then she looked up. “There is a small problem,” she said. I agreed it was a small cheque. “Nine Euros to pay in fifty one cents! No way.” I smiled brightly, thanked her and the cheque and I exited the bank together. It has now taken up permanent residence in my wallet, until maybe I’ll try a branch of the said German bank here, or I happen to be in Paris before it goes stale. I noticed they crossed it, so I can’t even use it at Mercadonna as part of my grocery bill. Has anyone got an old picture frame they don’t want? It might spur me to greater literary work if I can gaze on that every time I sit down to write. I am having a big problem deciding on a title for my next book. Why is it such a problem? Well it’s a memoir about my days working in the media and a large part of it describes the video shoots all round South Africa. and anything else I can think of in the meantime! The prize is a signed paperback copy of the new book delivered to your door PLUS an acknowledgement for the title in the book itself. I will publish the winner’s name by 20th October. This is what happens if you are flying the low cost airlines. Just look at what they have done to my ticket. Hardly smart is it? I shan’t be posting that in the scrap book. I actually wrote this blog while I was away on holiday, but don’t ask me how or why, but it disappeared off into the ether never to be seen or heard of again. I have mental pictures of it floating off into space to be picked up by some strange extraterrestrials who can’t make head nor tail of it. We do try and stay in places where they offer free WiFi but you can’t always rely on them. However I am getting ahead here, as I do need to start at the beginning. First very slight hitch was we we drove into the wrong car parking people, who directed us to the right place down the road. Good so far. We got on the plane, and we landed in Milan, after DH [Dear Husband] was kicked black and blue by the kid sitting next to him. [I just put the letter ‘o’ on Milan to be properly Italian, but it gave it a big underline in red, so I’ll stick to the usual way]. DH had sorted out exactly how to get to the hotel, so first we spent an hour on a coach. Yes, again, the cheap airlines do not fly to the cities they pretend they are going to. They choose an airport miles and miles away and then persuade you they’ve taken you to the right place. 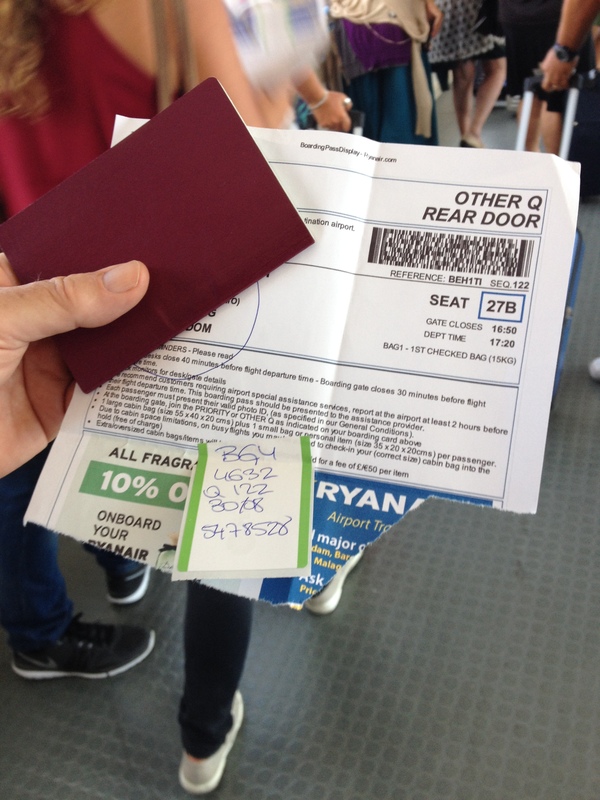 This has happened to us twice now, but luckily we were prepared, and when we flew into Bergamo we knew we were probably nearer Switzerland than Milan. I had left all the planning this time to DH. Off we hopped and gawped at the monstrosity that is Grand Central Station courtesy of Mussolini, who must have thought it quite beautiful. Frankly any architect who designs a place where you bring heavy luggage, and remember they didn’t have little wheels on their cases in those days, and builds horrendous flights of steps into the edifice deserves hanging upside down as well. Next part of the journey was by underground Metro, and we found this too, and DH went into the tobacconist’s to buy the tickets. To paint a complete picture, this is now after 10pm and the place is pretty well deserted. As we ascend on the escalator, I cheerfully remarked that this was indeed prime mugging territory. I spoke too late, by the time we reached the Metro platform, DH realized that his wallet was gone. And what was in the wallet? A chunk of our holiday money, all but one of the credit cards, health card, driving licence and, this is the terrible bit, the credit card DH uses to access his pension from South Africa. This one is serious as last time he lost the SA card, he had to get on a plane and fly to Durban to get the new pin number in person. We dashed up to the first floor, and made a beeline for the Carabinerra who did not seem either surprised or bothered. They directed us to the second floor to the police station. I’d rather hoped they would go screaming round the station accosting all suspicious people, but it seems they were on a smoke break below the ‘no smoking’ signs. And so the first two hours of our holiday was spent filling in forms and phoning Mastercard and Visa etc. DH was in a kind of shock and he was especially furious when yours truly began hunting through all the rubbish bins on the way back down to the Metro. I refused to keep the British ‘stiff upper lip’ routine and if passers by, and there were not many, thought I was a bag lady so what? By now the shop was shut and DH had to wrestle with the ticket machine. By the time we arrived in the almost deserted Duomo Square and made for the tram stop, we were barely on speaking terms. Well I was trying to be consoling and cheerful, but it wasn’t working. I asked if DH would like to go home on the next plane, but was met with snarls and grunts. The tram ride took us close to the hotel, now all we had to do was find it. Up and down the street, we were sure we were in the right place, we’d google earthed it and recognized the cafes on the corner. We walked up and down, we had the code to press that would open the door – if we could find the door. We counted the numbers and looked at the gigantic archway, and yes this was it. How were we to know that the name sign was way above our heads and that ‘albergo’ was the name for accommodation – like idiots we were looking for the word hotel. So we picked up the envelope with our room key and raced upstairs to contact the 24 hours South African bank service. The police were not going to phone them for us, that was asking too much. We had no internet code, but never mind we had our data packages we just needed to recharge the phones as they were both almost down to nothing. Enter my birthday present, a 4 in one charger for all our devices while away. I plugged it in and waited for the green light to come on and – it didn’t work. Why? I had done masses of research and even sent the URL eBay link through to DH as to exactly what I wanted, but he found one in our local town instead didn’t he? We were now cut off from the outside world and it felt scary. Next morning I grovelled at the reception desk to ask them to put my phone on charge, which they did, and for that I will add a brownie point to my Trip Advisor review, and then DH did the same. I was quite upset to discover this hotel did not serve breakfast, after I had offered to pack the mini cereal boxes, spoons and bowls and been told it was not necessary. By now we were both ravenous. Also we were none too pleased to find that the pre-paid museum passes and other stuff we had got on the net [you know the ‘you don’t have to queue’ ones] were all cheaper in Italy. 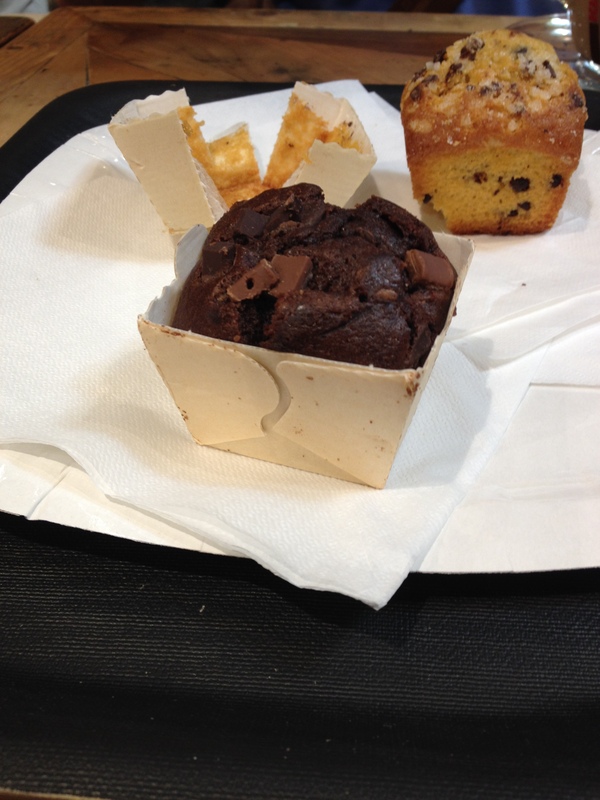 This is or rather was my birthday cake, by Tuesday morning when we were on our way to Venice DH called a truce. It was my birthday after all. I had further inflamed him the previous day by insisting we buy new charging points for the phones and iPads, before we explored the Duomo and then testing them in the next door cafe. I’m sure he was embarrassed, but I just told him to go away and pretend he didn’t know me, it was better than looking in rubbish bins wasn’t it? To add insult to injury, they threw him out of the cathedral for wearing shorts. This seemed very unfair, as there were lots of other people in there wearing shorts, and the only thing we could think of was that DH’s shorts did not cover his knees. Obviously God might be offended at the sight of DH’s knees, though I think they are quite nice myself. The rest of the holiday was fine, except that the train took us back through Bergamo from Venice to Milan for the final night, so next day it was the coach all the way out again to Bergamo for take off. I had left all the planning to DH and he hadn’t noticed this small fact. Venice was not really the best place for DH. He likes to know where he is at all times, and this can be tricky where the tiny alleyways wind around in all directions. Many hours were spent glued to the map trying to figure out where he was and the best way to go to the next interest point. Also DH is not particularly fond of large crowds, and there were an awful lot of other people there. But generally he was very brave about it all. We are safely home, and although I have not included many finer details, we can dine out on this for years.